Next week at EclipseCon 2011, it will be a year after we first presented some rough Git tooling to the eclipse.org community via a tutorial. At the time, the deal was that the tooling was in early stages and needed some love from early adopters to help improve the situation. 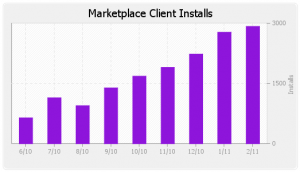 I’m happy that things have come quite a long way since last year based on Eclipse Marketplace stats and the community contributions the projects have received. So what’s next? In terms of tooling, we’re getting closer to our 1.0 release (which is planned for the Indigo release). The git tooling at Eclipse is much better these days, if you need help or have questions, please start with the most excellent EGit User Guide. From our user guide, you should tell that we support the majority of the common work flows now. If something is missing, please let us know by filing bugs or contributing. If you’re an eclipse.org project, please consider starting the process to move your project repository to Git. There are a lot of eclipse.org projects already on Git. You can find great documentation at Eclipsepedia on how to do the move. It’s not that bad, the LinuxTools project has recently migrated to Git and the CDT project has stated that they will start the process after the Indigo release. It would be nice to see the all of the eclipse.org projects have plans to move to Git by the Indigo release. A portion of the EGit and JGit teams will be at EclipseCon 2011, so please swing by our tutorial and track us down if you have any issues moving to Git or using the tooling. We believe that the tooling is good enough now to meet the majority of eclipse.org committer needs. All of us want to see eclipse.org fully on Git by the end of the year, so let’s work together to make this happen. If people think holding a BOF about moving eclipse.org projects to Git is a good idea, let us know and we can do it.